Okay, so it is Australia Day and I know I have to cook some lamb. Why, there are always ads on TV pre Australia Day that everyone should eat lamb, and as I love to play along, I will cook lamb. So I decided I would bake a leg of lamb. Now I don't often roast meat in my oven, I get concerned that I'll over cook it or under cook it, so I usually buy pieces of meat which my husband barbecues. But today I decided I was going to bake a leg of lamb. So off I go on my google searches looking for a recipe, once I have found what I am looking for, I look at few other recipes to see what are the suggested cooking times, so I have a guide as to how to cook the meat and for how long. Okay the guide I used is basically you roast the meat for 20 minutes at 200C, then you reduce the temperature down to 180C and bake it for 20 minutes per every 450g of meat you have. So for my recipe I had a 2.4kg leg of lamb so I baked it for 20 minutes at 200C then I baked it at 180C for 2400g/450g which gives me 5.3 x 20min which equals 1 hour and 45 minutes. If you really like pink lamb, take it out after 1 hour and 30 minutes, if you like it well done bake it longer. Now I have baked a leg of lamb before, once I even slow cooked it for 7 hours, it was okay, just not worth a 7 hour cooking process. I know from another time that my husband dislikes when garlic is poked into the meat before baking, he finds the garlic overpowering this way. So in all honesty I have baked lamb before and although it was nice, I would not make it again and I definitely wouldn't post it here. So this lamb I found delicious. The crust that forms on the lamb is so tasty, we loved it. Now after the cooking time was done, the lamb comes out slightly pink, with a little more pinkness (I know that is not a word) right next to the bone. So if you don't want pink lamb, bake it for a further 20-30 minutes. 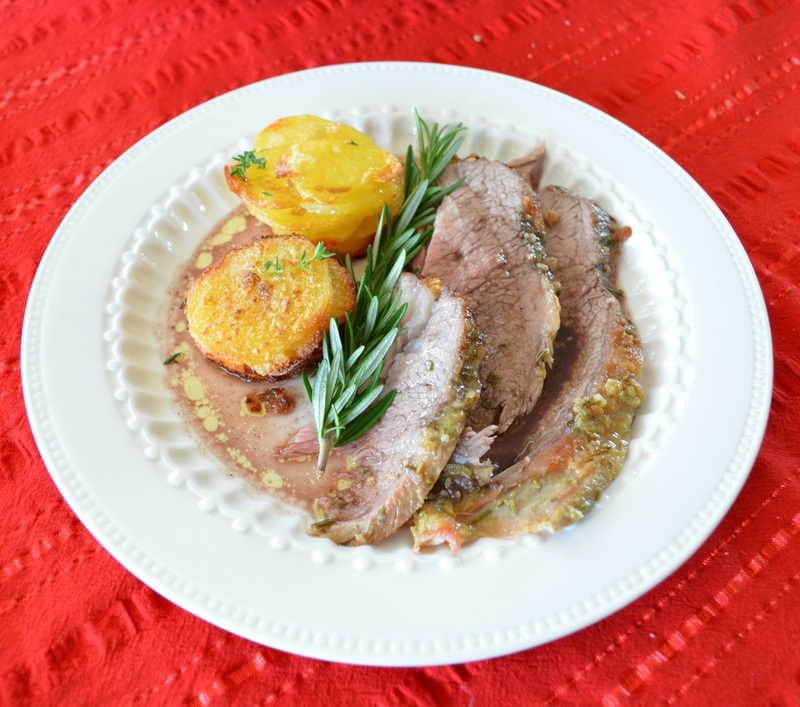 So if you are looking at trying to bake a leg of lamb this is an easy, yet tasty recipe to try. Pat dry lamb and remove as much excess fat from the lamb as possible. A little left on is okay, you can make shallow cuts into that, it crisps up, you just don't want thick large pieces of fat on the meat. Rub 2 tablespoons of the olive oil all over the lamb leg. Place the garlic and salt in a mortar and pestle and pound it until you get a garlicky paste (you can just chop it up finely with a knife if you do not have a mortar and pestle). Stir in the rosemary, pepper and mustard. Place the remaining oil in your roasting dish. Put the lightly oiled lamb in your roasting dish and rub the paste all over your lamb. Leave it to stand at room temperature for 30 minutes. Roast lamb, uncovered, for 20 minutes. 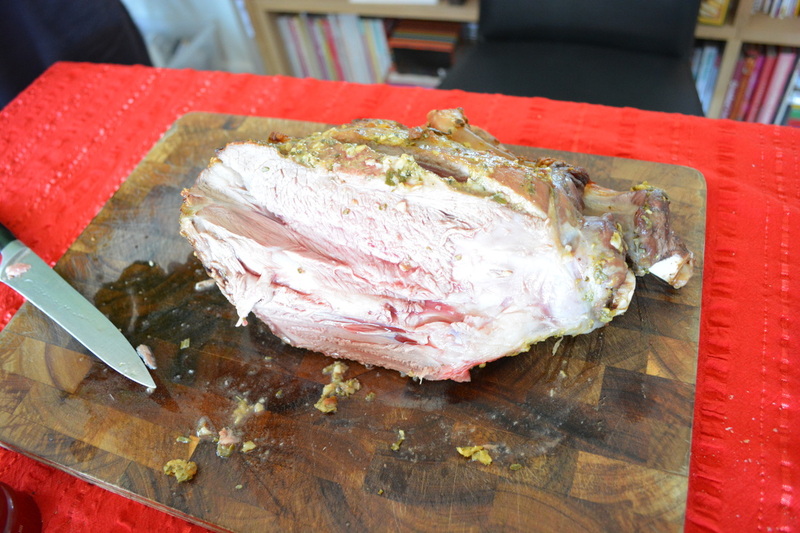 Reduce oven temperature to 180C, and roast lamb for a further 1 hour and 45 minutes. 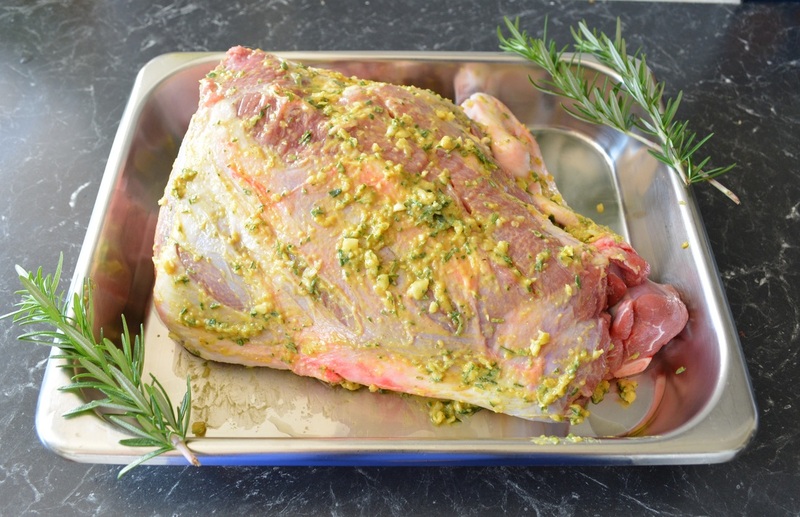 Remove lamb from baking dish and allow to stand, loosely covered, for 15-20 minutes. Meanwhile add wine to your roasting pan and deglaze by boiling over moderately high heat, stirring and scraping up brown bits for 1 minute. If you can't place the baking pan onto a flame, just use the wine to deglaze it, then pour into a saucepan and boil for 1 minute. Now with the liquid in the roasting pan, remove the visible excess oil, leaving the wine and the meat juices. The oil will sit on the top and is easy to remove. In a small bowl whisk together the cornflour and the water, once combined add to the wine in the roasting pan. Bring to the boil and simmer for 2-3 minutes. Season with pepper if needed. If too salty, see tips above. Strain the sauce into a serving jug. Serve lamb sliced with a drizzle of the sauce, some baked potatoes and fresh green salad.